THE GOVERNMENT WAS accused of taking medical cards from families with specific illnesses. However, Minister of State Alex White said that the system doesn’t retain information on illnesses so that it’s not even a possibility. However he did say that medical conditions can come into play for discretionary medical cards. Fine Gael TD Jerry Buttimer said “it is a fact that many families are having great difficulty”. Families of Down Syndrome children say there is a blatant attempt not to give medical cards to them. 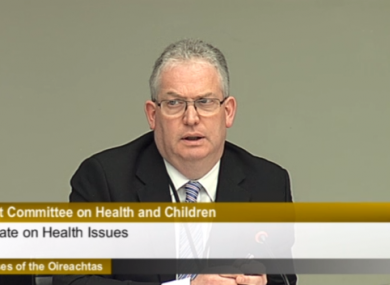 However, Director General of the HSE Tony O’Brien said “the illness itself is not a qualifying criteria” and that there is no targeting of any specific group. There is no targeting based on medical condition or otherwise. I can categorically say it isn’t happening. The ambulance service also came back into the limelight during the morning hearing. Sinn Féin TD Caoimhghín Ó Caoláin said that the “ambulance service is not safe, not responsive and not fit for purpose”. He said that was a widespread view and described a personal experience where an ambulance drove 40 miles to come to his home when there was an ambulance just a quarter of a mile away. Let’s be very clear . They are under resourced, it is detrimental in terms of injury and loss of life. He said that he believes we need a national ambulance authority outside of the HSE. Alex White again called on the IMO to speak with him about the new contract for GPs. The government were accused of gagging GPs under the new contract. However White said that there was no question of gagging orders being put on general practitioners. In the course of the engagement that we have to have. I think we will be persuaded that it should be reworded but we can’t negotiate with ourselves. He said the so-called gagging clause was not their intention. He added that it’s a draft contract and that we need to discuss it. When we put out a draft contract, that’s our proposal. It was not the last word, it’s our initial offering. The government was also accused of training nurses for export when Ireland needs them for its services. Senator John Crown claimed “the mediocre quality delivered to patients needs to be addressed”. Email “Government accused of targeting people with Down Syndrome in medical card removal ”. Feedback on “Government accused of targeting people with Down Syndrome in medical card removal ”.